Beautiful filing keeps with the hardwood style of your luxury office. The Artesa Lateral File Console is elegant but features angular style details including a champfer edge top and corbel supports; and tapered legs, narrowing toward the top. Arched trestles support the legs over the sides. The symmetrical face of this stylish piece include central file drawers and recessed panel doors on either side. 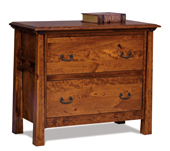 This solid wood file console boasts heirloom quality craftsmanship and will decorate your office for years to come. The Artesa 2 Drawer File Cabinet has a bevel edge top with corbel supports, tapered legs that narrow at the top, arched trestles decorating the panel sides, and flush file drawers for heirloom function. The pictured Ashton File Cabinet is built in qs white oak with Michaels Cherry stain. The pictured Ashton Lateral File Cabinet is built in qs white oak with Michaels Cherry stain. The sophisticated beauty and versatility of the Amish Bellamy File Lateral Bookcase Hutch saves the day from unorganized paperwork and clutter. This file cabinet makes a great addition to the sturdy Bellamy L Desk. Replace the rusty and ugly metal file cabinets in your home with this appealing piece of furniture. Amish Bellamy File Lateral with Bookcase Hutch features two 5/8" thick dovetailed drawer cabinets and three levels of shelves for your books. Our Amish furniture pieces are highly customizable. You may opt for a bookcase hutch or not and you can also choose to add drawer locks. Select from our wide array of finishing options and wood type: Oak, Brown Maple, Hickory, Rustic Cherry, Rustic Hickory, Elm, QS White Oak, Cherry, Walnut and Hard Maple. 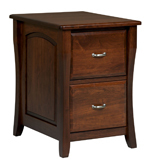 The pictured Belmont File Cabinet is built in qs white oak with Michaels Cherry stain. The pictured Belmont Lateral File Cabinet is built in qs white oak with Asbury Brown stain. Upgrade your home filing system with this attractive cabinet. With two large drawers, this file cabinet can easily fit large collections of personal or business paperwork. Unique for a file cabinet, this Berkley cabinet is set up so it is wider than it is longer, unlike most cabinets. This cabinet looks like a small dresser or table but is actually a filing system to keep your valuables in order.